The 2008 season was a year full of lowlights. After winning the NFC West the previous 4 years, 2008 was supposed to be the year we get back and contend for a Super Bowl title, to send retiring head coach Mike Holmgren out on top. Instead, it seemed as though the horrible draft picks and transactions general manager Tim Ruskell had made during his tenure had finally caught up to us. After starting the season 2-5, the Seahawks lost their next 6 games. After a win in week 15 over the St. Louis Rams, the Seahawks came home for their home finale against the New York Jets with a 3-11 record. To some the regular season home finale was going to be just another game, marking the end of a miserable season. 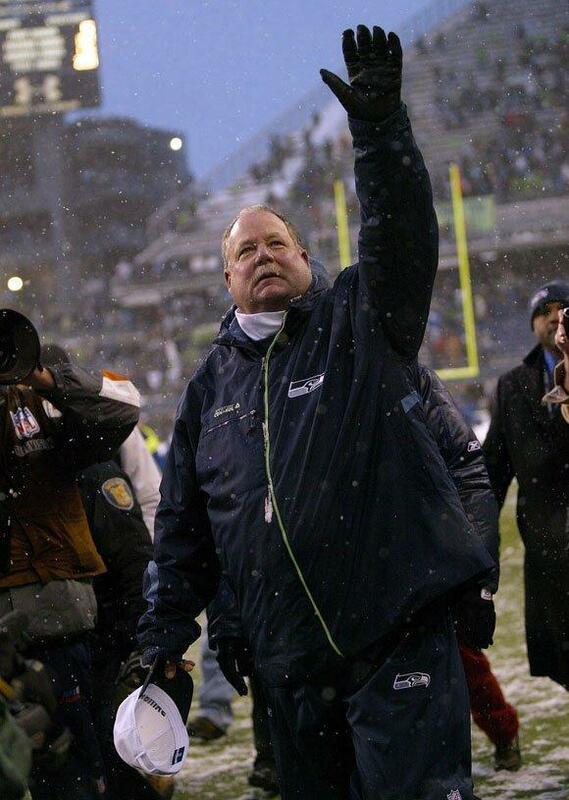 To many more it was the opportunity to say thank you and farewell to Coach Holmgren after 10 wonderful seasons. To me however, there was another element to what made this game so special; the elements. 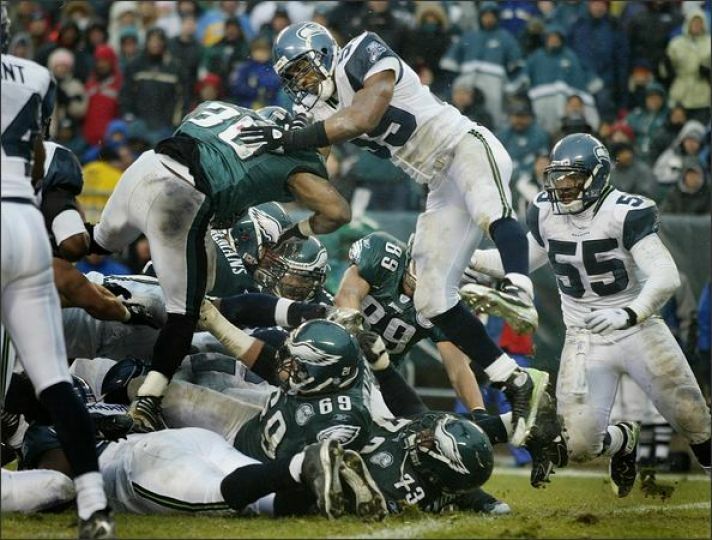 The date of this game was December 21st, 2008 and it fell right in the middle of a two-plus weeklong snow storm which blanketed all of Western Washington. With several inches of snow already on the ground and 5 more inches of snow predicted to fall on game day, it had the makings of a classic game reserved for Green Bay, Philadelphia, or another East Coast city. It was going to be a challenge for me and my friend Dylan to even make it, but no blizzard was going to prevent me from missing a Seahawks home game. We lived a 5-minute drive away from each other; myself in the hills east of I-405, Dylan along Lake Washington west of the freeway. On this day however, it took us almost a half an hour to meet up, as Dylan’s parents were going to pick us up and drive us into downtown Bellevue to catch one of the very few busses heading into downtown. Once we got to the bus stop I swear we waited for almost an hour for the 550 bus to get there. We eventually hopped on and smoothly made our way over I-90 and into downtown Seattle. The bus dropped us off on the corner of 5th Avenue and King Street and we started the trek through the International District to Qwest Field. After crossing 4th Avenue and the sky bridge over the King Street Station train tracks, we walked down the steps and were instantly in an ice rink, as the parking lot had been frozen over and covered in day-old snow. In the middle of the parking lot there was a snow pile about 10 feet high where people were jumping into it and making snow angels. 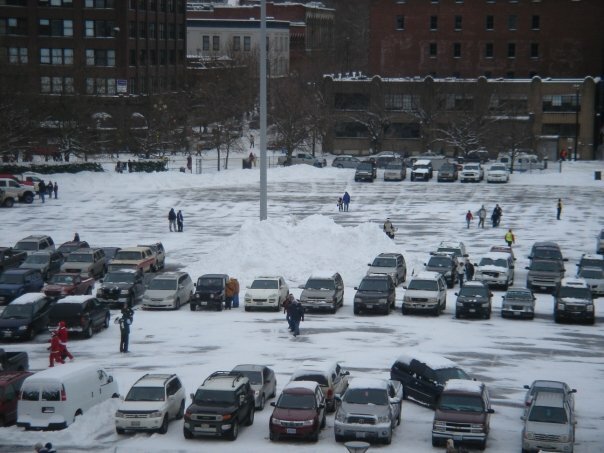 A 10 foot high snow pile accompanied a completely frozen over stadium parking lot. I had never seen that much snow in Seattle before, much less in a pile like that. Once inside the stadium we headed up to our seats. Looking around the inside of the stadium, I noticed that snow was still present in many uncovered sections, especially in the corners of the upper deck. 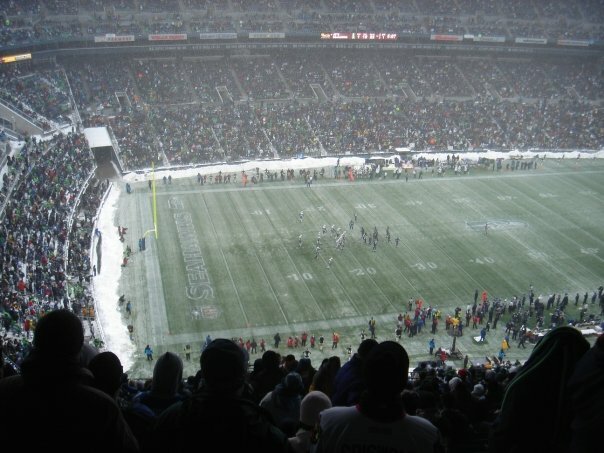 On the sides of the Hawks Nest in the north end zone, some seats were covered completely with snow, forcing the ticket holders of those seats to sit on snowbanks for the duration of the game. I had seen that happen at games on the East Coast but I never imagined that could happen in Seattle. When it was all said and done, I imagine only about 55,000 of the 68,000 seats were occupied. It was definitely the smallest crowd for a Seahawks home game in the history of the stadium but it was completely reasonable to believe the remainder physically could not get into downtown Seattle because of all the snow. The view from my seats on December 21st, 2008. Snow blanketed the field and snow piles bordered the turf. Before the game the Seahawks ran out of the tunnel and they had Coach Holmgren run out of the tunnel last as fireworks shot off all around, something usually reserved only for the starting offensive or defensive unit. Mike’s wife Kathy raised the 12th Man Flag to thundering cheers. Because of the snow, the game did not feature many notable plays but it was very close, exciting game throughout. The Seahawks took a 7-3 lead in the second quarter and did not look back. The dagger was a Brett Favre pass which was picked off by Seahawks cornerback Josh Wilson. Wilson went to the area behind the south endzone and celebrated his interception by flinging snow up into the air, snow that bordered the entire field. Although it was only the 4th (and final) win of our 2008 season, the mood inside the stadium felt like we had just clinched a playoff berth. After the game Coach Holmgren, the winningest coach in Seahawks history, did a victory lap around the stadium saluting the fans and thanking them for 10 seasons during which he led the Seahawks to 5 division championships, one conference championship, and one Super Bowl appearance. After the game posed the challenge of us getting back home to Bellevue. With the sun having already gone down and the snow starting to fall once again, we hiked to the bus stop 5 blocks north of the stadium and waited as several cars tried to drive through the difficult terrain. We even helped a couple of stuck cars trying to drive up the streets by pushing them up the hill. After waiting almost ANOTHER hour we finally got on the bus and headed back to the Eastside, making it home for only the end of Sunday Night Football. It has not snowed at a Seahawks home game since this day, but I am hoping that the snow graces the Clink with its presence once again sometime real soon. Today’s sequence of events proves two things; that anything is possible, and that head coach Pete Carroll and general manager John Schneider will go to any great length to improve this roster. The Seahawks were not expected to swim around the possibility of adding a big name when the new league year and free agency began on Tuesday, but they certainly made a big splash. 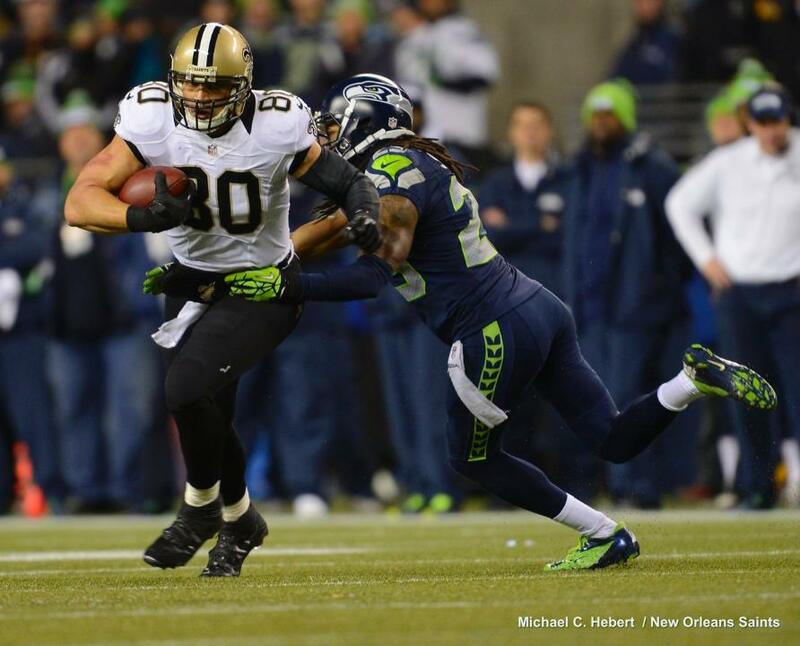 The Seahawks traded center Max Unger and their 2015 1st round draft pick (#31 overall) to the New Orleans Saints for tight end Jimmy Graham and the Saints 4th round draft pick (#109 overall). With this one move numerous points have come to the surface that I believe must be discussed. Here are my thoughts on today’s trade. Adding Graham: There is no question that Jimmy Graham instantly becomes the best receiver on the Seahawks roster. Graham is a three-time pro bowler and 2013 All-Pro who is a matchup nightmare for any opposing defense. For 5 years we have watched Graham and Saints quarterback Drew Brees connect for 54 total touchdowns. Only the tandem of Tom Brady and Rob Gronkowski had more touchdowns in this span. What I am not so hot on is the Seahawks inheriting Graham’s $9 million salary for 2015, making him the second highest paid offensive player on the roster. With Richard Sherman, Earl Thomas, Kam Chancellor, and Marshawn Lynch having already signed lucrative deals with Russell Wilson and Bobby Wagner also due to cash in soon, I believe that this move may make sense only in the short term. After this upcoming season things could get very interesting. And complicated. Graham will certainly see his fair share of targets and his presence in red zone will certainly improve the 20th ranked red zone offense last season. 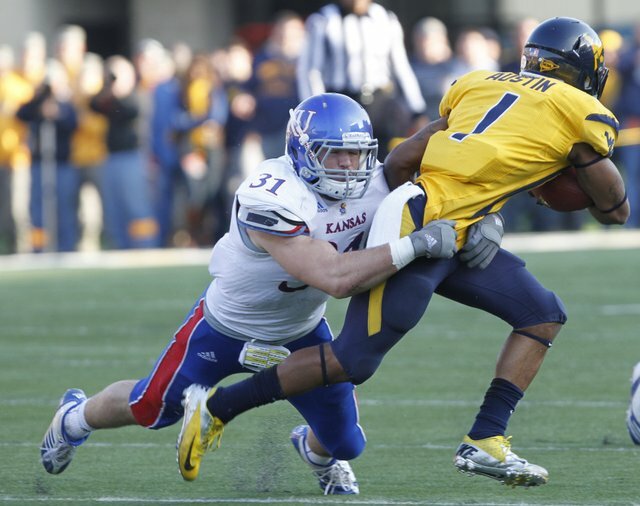 I believe the Seahawks need to add another weapon on the outside but adding Graham is certainly a good start to making our offense more explosive vertically. The Seahawks are comfortable going into 2015 with Patrick Lewis as our starting center (The Seahawks proved they could win without Unger at the end of last season, going 6-0 in the final 6 regular season games, all of which Unger was injured). John Schneider has his eyes on a free agent center that he may look to bring in to replace Unger. (Jonathan Goodwin and Chris Myers are the best available veteran free agent centers according to ESPN). 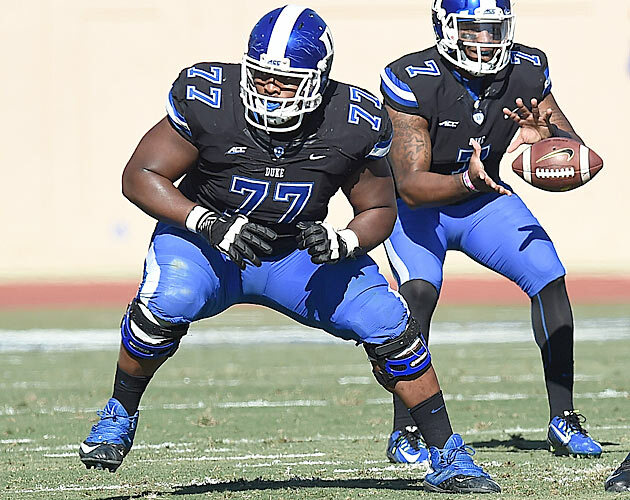 Schneider has fallen in love with a center in the 2015 draft who he believes could still be on the board when the Seahawks make their first pick (#62 overall). Time will tell but at this point I cannot simply say one team won this trade and the other lost. Both teams are giving up a significant player but are receiving a significant player in return. If the Seahawks use Graham just like he was used in New Orleans, it is going to be awfully difficult to stop our offense in 2015. For the third straight season, the Seahawks travel to Charlotte to take on the Carolina Panthers. After two straight losses the Seahawks currently sit at 3-3, 3rd in the NFC West. After winning the NFC South a season ago the Panthers currently sit atop the division once again this season. Following their loss to the Green Bay Packers last week, Carolina sports a 3-3-1 record. The Seahawks lead the all-time series with the Panthers 5-2. Their last meeting came on opening day last season when the Seahawks went into Bank of America Stadium and squeaked out a 12-7 victory to get their 2013 season started on the right foot. With this week’s game coming on the road and the Seahawks looking at a possible 3-4 record, I am calling this week’s game a must-win. Here is what I will be looking for out of both the Seahawks and Panthers this week. In their three road games this season the Seahawks defense has allowed an average of 25 points per game. With the same core group on the defensive side of the ball over the past 3 seasons the Seahawks have allowed only 19 total points in our road games against the Panthers in 2012 and 2013. This week the Seahawks need to do what they have done in these prior two games; get off the field on third down and do not let Panthers quarterback Cam Newton pick up large chunks of yardage both on the ground and through the air. Last season against Seattle the Panthers were 45% effective on third down. The Rams were 44% effective on third down last week which is unacceptable. If the Seahawks can hold Carolina to under 40% effectiveness on third down we will be able to force changes in possession, giving the ball to our offense to try to score points. 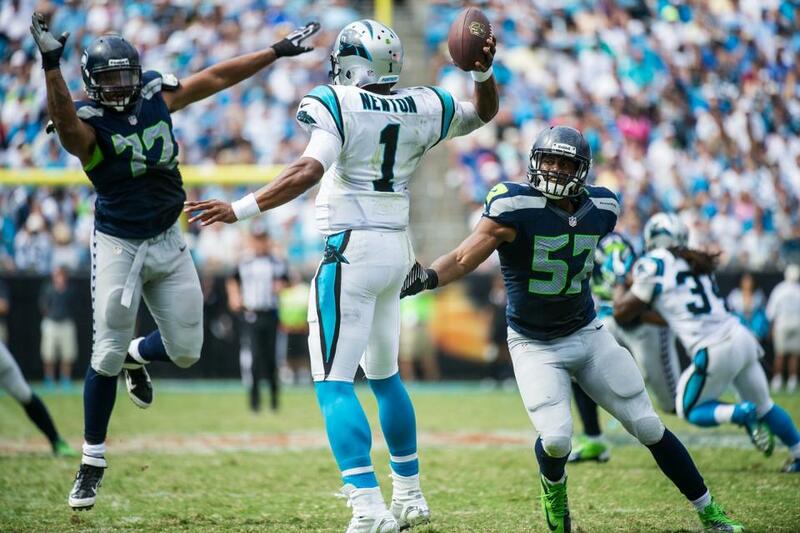 The biggest concern for the Seahawks defense this week will be stopping Cam Newton’s legs as well as his arm. I include his arm because of the comfort opposing quarterbacks have had in the pocket in recent weeks. The Seahawks have proven that they can shut Newton down on the ground; Newton has averaged 40 rushing yards per game in two games against Seattle. If the Panthers win this game I believe it will be on the arm of Cam Newton. With as shaky as the Seahawks have played in the middle of the field recently, look for Newton to test the Seahawks linebackers on short/intermediate range throws this week. Greg Olsen and Brandon Williams, Carolina’s two tight ends, could be in for big games if Newton has time to make throws. I am calling upon the Seahawks pass rush as well as linebackers K.J. Wright and Malcolm Smith to step up. 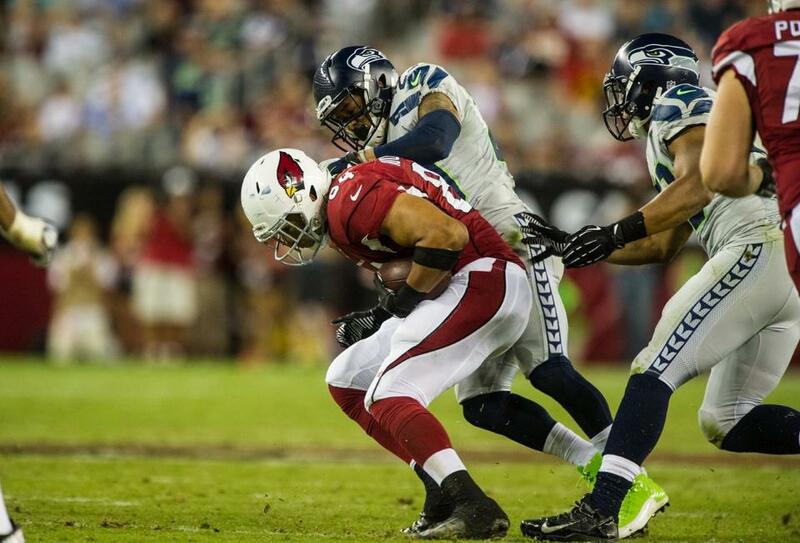 If the linebackers struggle it could once again be a long day for the Seahawks. Last week the Seahawks fed the ball to running back Marshawn Lynch 18 times for 53 yards. It was not until the second half that the offensive coaching staff got quarterback Russell Wilson involved in the running game. The play in the running game will determine how well the Seahawks offense plays once again this week, but the pocket protection for Wilson must improve so Wilson does not have to run so much. Center Max Unger will likely be inactive once again this week so the Seahawks will start the same line combination they did in St. Louis last week. Until this makeshift line can prove that they can give Wilson a clean pocket consistently, in addition to avoid falling into an early deficit, Wilson may run more early on in the game. This week I believe rookie wide receiver Paul Richardson will have a larger impact after catching 4 passes last week. Richardson could be Wilson’s unsung go-to guy this week, possibly in roles that Percy Harvin held prior to his trade to New York. Also keep an eye on the blocking of fill-in fullback Robert Turbin. Turbin filled in last week at fullback on short notice after starter Derrick Coleman broke his foot during pregame warmups. In my opinion Turbin is built like a fullback and with a week’s worth of practice and preparation under his belt I think Turbin carries the potential to help open up big running lanes for Lynch. Perhaps above all else, the Seahawks cannot let the off-the-field noise that has come in the days since the Percy Harvin trade get to them on the field. There have been numerous reports over the past week about tension between different players and the potential of a broken locker room. What makes all this talk worse is the fact that we have lost two straight games. To get back on the right track, we need to win this week. A win can help silence the critics and hopefully bring the positive dawn of the post-Harvin era. Last season the Carolina Panthers defense carried them to a 12-4 record and an NFC South division championship. Even after losing key members of their defensive unit the Panthers still have the talent that is keeping them on top of the division even if their total defense rankings do not highlight it (22nd in passing, 26th in rushing). 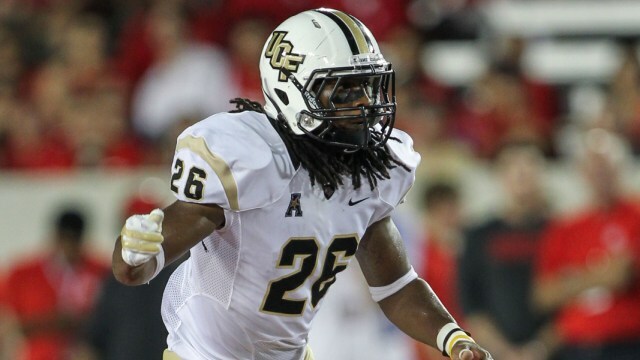 The Panthers provide a good combination of pass rush (15 total sacks) and secondary play (7 interceptions). Middle Linebacker Luke Kuechly continues to be a dominant tackler, patrolling the middle of the field and being in on almost every play. With the shaky play of the Seahawks offensive line I have decided to focus my attention on the Carolina defense to the pass rush. My X-Factor player to watch for the Panthers this week is defensive end Charles Johnson. Johnson is in his 8th season with the Panthers he has recorded double digit sacks in three different seasons including the past two. So far this season Johnson has recorded 3 sacks, one in each of their last 3 games. Johnson will likely line up across from Seahawks rookie right tackle Justin Britt, who has struggled keeping defenders from penetrating the line on passing downs. Random Thoughts: No word yet on jersey combination for the Seahawks this week. With 5 road games left and 2 opportunities to wear wolf grey that gives the Seahawks a 40% chance of wearing wolf grey this week… The Panthers will wear black jerseys with silver pants… Ian Eagle and Dan Fouts have the call for CBS this week. That’s right, this week’s Seahawks game has been cross-flexed from FOX to CBS. This will be the first Seahawks road game broadcasted on CBS since 2001, and personally this will be the first time I watch a regular season Seahawks game on CBS since Christmas Eve 2005… Walt Coleman is the referee this week… Second straight 10am kickoff. I really have a love/hate relationship with 10am kickoffs. The only question this week is do I get up earlier to watch Falcons/Lions which kicks off from London at 6:30am… After this week we play 3 of our next 4 games at home. These road stretches where we don’t play at home for 3-plus weeks are miserable… I’m pulling for the Eagles this week. Please, please, please beat the Cardinals for us! Prediction: The Seahawks running game will finally get going early this week. Marshawn Lynch and Russell Wilson will combine for 140 yards but unfortunately too many drives will stall or result in field goals. 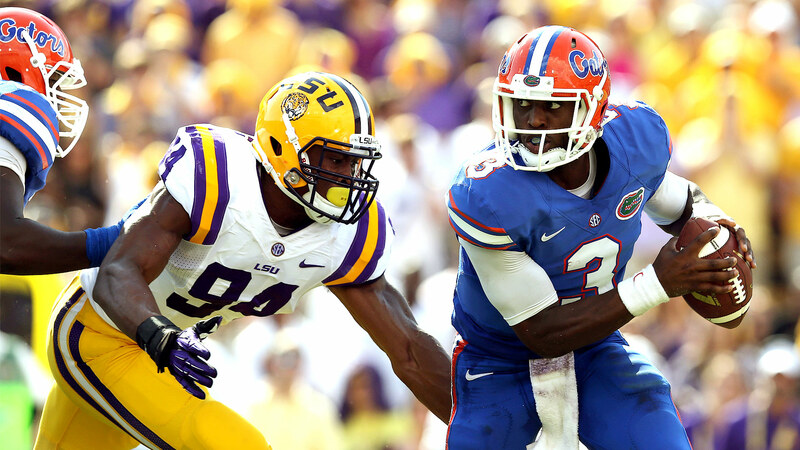 The defense will play a much tighter game overall. The Seahawks will win the turnover battle 2-1 and the Seahawks will pull out a very close victory. Check back late Sunday night for my review of this game. Enjoy the game everyone. Go Seahawks!